The DTB Cup Finals were contested today, and Cheng Fei walked away with dominating victories on her three events, vault, beam and floor. Before I go into the details, the news and how this affects world rankings. Results are at the bottom. This event was only televised in China as far as I know, but video of Cheng’s three victory routines is available on youtube from WangXiangu. Fei will remain second in the vault rankings, unable to overtake Oksana Chusovitina’s giant lead. However, it looks like Chusovitina will probably not be able to compete in the World Cup Final in Madrid, meaning Fei will go into that event as the highest-ranked vaulter. Pavlova will remain in third. Aasje Van Walleghem will move into the high teens from a rank of 22. He Ning‘s finish on bars won’t move her into contention for the WCF. Anastasia Koval, currently 15th, will move up, but she’s behind a number of strong contenders and even long-retired Emilie Lepennec. Fei’s win on beam will move her ahead of Shawn Johnson and into fourth in the world rankings. She would have gone to the WCF on this event anyway. She will not, however, pass Pavlova, currently in third. Mitchell, currently ranked 27th, will move into the high teens in rank, but that probably won’t do much for her. Yang is not currently ranked in the top thirty. The big news is that Cheng’s win on floor will move her above Sandra Izbasa into the first rank on floor. Neither Yang nor Mitchell are in the top thirty anyway. Bars was competed before vault today, but I’m going to do my discussion in Olympic order. By the way, I’m getting all of my information from the DTB ticker, which was incidentally a nice addition to the organization of this meet. Cheng and Pavlova, given their start values, were the two to beat on this event, and wound up finishing 1-2. Both competed a a DTY and round-off half-ons with layout front half-offs. Fei completed her DTY with a small step for a 15.125 and also performed a solid second vault. Pavlova finished with a substantial enough step on the Yurchenko to finish with a 14.700 and a fall to the knee on the half-on layout front half-off for a 13.400. Aagje Van Walleghem of Belgium competed a Yurchenko 3/2 with a big jump forward on the landing and a well-done half-on piked front half-off to take the bronze. For those not familiar with the name, Van Walleghem has been around for quite some time (she is now 21) and competed at Athens, but missed qualifying to Beijing after a below-par performance at Worlds in 2007. Incidentally, Elena Zamolodchikova competed the same two vaults as Cheng and Pavlova, but with major missteps, including a bent forward landing on the DTY (14.625) and a fall forward on her half-on layout front half-off (13.825). She finished sixth. Despite the highest start value of the day on a laid-out Rudi (6.3), Ariella Käslin finished fourth after falling on the Rudi and competing only a Yurchenko full as her second vault. Bars was a fairly low-key affair with only He Ningand Koval as legitimate contenders. They both began with 6.9 start values. Kim Bui and Jenny Brunner (6.6 and 6.5 start values) could possibly have competed against them, but had major mistakes and wound up with B-scores in the 7’s. He Ning threw both straddled and piked Jaegers, showed nice el-grip work and finished with a solid double layout dismount. Koval, the fifth-place finisher in Beijing, performed a piked Hindorff, a Stadler full-in to a high Tkatchev and a stuck double front dismount. The Germans, Brunner and Bui, placed third and fifth. Brunner performed a piked Jaeger and a layout front with half-twist dismount. Bui went from fourth in qualifications to fifth in finals after a problem on the low bar despite a nice Shapashnikova and a good Geinger with a Tsukahara dismount. Note that Yang probably would have been in this final if it hadn’t been for a fall on a 1.5 pirouette and a few steps on her dismount in qualifications. The beam final finished in A-score order, with Cheng on top and Australia’s beam specialist Lauren Mitchell taking silver. Yang, depsite the problems on bars, came back for a third-place finish on beam (and floor, see below). Cheng had no major errors despite a step sideways on her 2.5 twisting dismount dismount, though she had some small steps, notably on her standing pike. Mitchell continues to do the squat double turn, which I hate, and had a problem hafter her layout stepout layout back, but finished solidly after perofrming a good aerial to two feet and a standing front tuck and a flick-flack to double pike. Yang performed an Onodi flip-flop layout step-out combo and had no major errors except a small step on her 2.5 twisting dismount. Yulia Lozhecko was wobbly on her front aerial to scale and side somis and performed only an OK double pike dismount to finish sixth. Most importantly and sadly, Pavlova had some major wobbles during her routine, including on the full turn, and fell on her dismount, injuring her knee. Maybe the biggest news on the floor final is that Bui tied with Yang for third. Yang went OOB on her 2.5 twist and underrotated her triple twist mount. Apparently her triple turn was very pretty, and was quite nearly a 3.5. Bui performed a Tsukahara with a small step and nailed her 2.5 twist to layout with a half, 1.5 forward twist and double pike dismount. 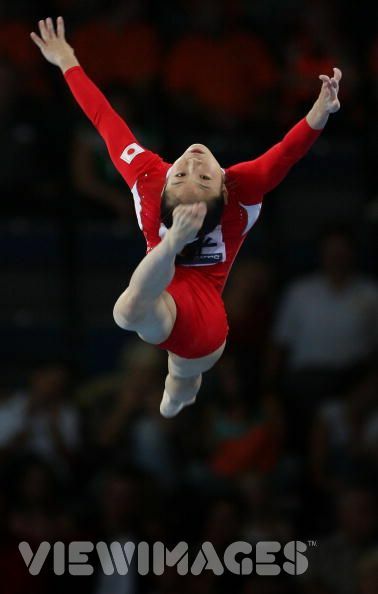 Cheng took first, as noted, with a piked Tsukahara, triple twist, 1.5 twist to full and a 2.5 twisting dismount. Mitchell finished second with a piked Tsukahara (OOB), a double Arabian, a nice double twist and a double pike dismount, all with generally strong landings, but fell out of her triple turn. Daniele Hypolito was a disappointment, finishing wiht a score in the 12’s with a double pike mount and an underroted 2.5 twisting dismount. Lauren Mitchell: An Australian with a skill named after her in the upcoming CoP! (It’s a jump to chest stand to chest roll with a 1/2 turn. She performed it at the Olys.) Mitchell’s a star on beam: she matched Monette Russo’s fifth-place finish at a Worlds on that apparatus, and earned a silver at the Good Luck Beijing event. She also took silver on this apparatus at last year’s DTB! Mitchell underperformed on BB in qualifications at Beijing, but scored a respectable 15.550 in TF. Daniele Hypolito: Well, Brazil has sent someone to DTB despite a fairly major scandal a-brewing back home. Of course, Hypolito left the national training center at Curitiba to train in Rio. But the girl is a legend: seven world championships, including Brazil’s first medal, and three Olympics. She wasn’t on FX in Olympic TF, so I’d be glad to see it. Cheng Fei: Everyone breath a collective sigh of joy/relief. The great Cheng has not yet retired! Honestly, of anyone, she inspires very little but admiration in the gymnastics community, which is saying a lot for people who curse each other over their disagreements about Shawn Johnson and Nastia Liukin. As Sandra Izbasa said in a recent interview, Cheng is an exceptional athlete and a perfectionist, and on top of that she has heaps of character.” And her FX is great, and I can’t wait to see her vault up to par again. After the Olympics, it became widely known that Fei had been on a punishing diet for nearly a year leading up to 2008. Hopefully this is no longer the case. Yang Yilin: I’m excited to see the newly crowned Chinese national champion and great UB worker Yang return to international competition. 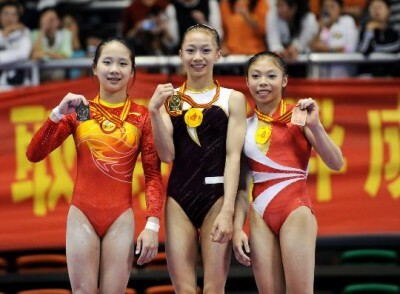 Best Chinese finish in the Olympic AA, taking bronze, despite really little international experience. ‘Nuff said. At her first WC event since the Olys, she took first on UB and second on FX. Yulia Lozhecko: Lozhecko was last seen at Worlds in 2007 watering down her routine on BB (thereby losing her chance at EF qualification) and earning herself a ban from training camps for the rest of the year. She then came bouncing back at her first national competition in February to take gold over the likes of … well, the future Olympians. It’ll be great to see her back. Anna Pavlova: I can’t wait to see some nice floor. I’m so psyched that Pavlova — considered to be the most classical Russian gymnast out there — will be continuing. She’s had a hard career, fourth in the Olympics in 2004, the scratch on the vault for a 0.000 and last-place finish in the 2008 EF, the fourth-place finish on BB. She took first on BB at this competition in 2006, and first on VT in 2004. Honestly, the girl is a solid three-event gymnast, and a powerful and elegant one at that. She’s great. Elena Zamolodchikova: She’s baaaa-ack! She’s never been my favorite, but talk about longevity. Two Olympics, neither of which was 2008. She was in decent form at 2007 Worlds, but the lasting image of her there was sticking her vault after Ekaterina Kramarenko scratched on that apparatus, taking a 0.000 and leaving Russia in 8th. She didn’t quite make it to her third Olympics … is this evidence that she’s considering a FOURTH quad? (Too soon to tell.) She competed at DTB in 2002, taking second on BB and VT; in 2003, taking first on VT; in 2004, taking second on VT; and in 2006, taking third on VT. So basically, it’d be freaking awesome if she won VT again. Anastasia Koval: Koval’s got a great UB routine and a decent start score, though she’ll face stiff and likely insurmountable competition from at least Ning and Yang. She’s young and a good one to watch — only sixteen, and with big international competitions limited so far to 2007 Worlds, 2008 Euros, and the Olympics. Alina Kozich: Kozich is coming off a third-place finish on BB and a first-place finish on FX (with a beautiful routine, although curiously in that French leo with the silly slit down the front) at Glasgow. 2004 Olympian and European champion, and a nice second-place finish on BB at this year’s Euros, but she’s struggled a bit in the past quad. I hope this means she’s continuing! The full roster is available here. The Arthur Gander Memorial, held October 29th, is a competition run by the Swiss, and named after a former FIG president, and has a slightly odd format. Each gymnast competes three of four events. China, Romania and Russia each competed top female gymnasts: He Ning from China, Sandra Izbasa from Romania, and Ksenia Afanasyeva from Russia. Germany sent Oksana Chusovitina, although Marie-Sophie Hindermann was supposed to compete but withdrew because of surgery for her Achilles. Izbasa competed a slightly watered-down version of her floor routine, and took a step out of bounds, but continued to land solidly. Izbasa just keeps going up and up in my persoal rankings: she’s competing in four more competitions in the next six weeks and is, according to Nicolae Forminte, the only Romanian currently ready to compete. In this IG article Forminte says that Ana Maria Tamirjan, Gabriela Dragoi and Andreea Grigore are all injured, and that all of the others are “struggling to find motivation,” which could be a problem for my favorite team, sadly. ThePenguin888 over at YouTube has some other good vids. In the first round, each gymnast from each team competes on one apparatus of his/her choice. In the second round, each gymnast competes on a second apparatus of his/her choice. After the second round, four teams are cut based on total score (from the two rounds). In the semifinals, each gymnast competes on one apparatus of his/her choice, but the apparatus may not be one of the apparatus competed in the first two rounds. On the basis of scores from the first three rounds, four teams are cut. In the final, each gymnast competes on one apparatus of his/her choice, but the apparatus may not be the apparatus competed in the semifinals. The winner is determined by the combined score from the finals round only. Exciting for me was also that Youna Dufournet of France competed, although the French team finished only ninth after she fell repeatedly on a pirouette on bars. The Germans did not perform well, with Chusovitina taking a nasty fall on beam. Word has it that she may have torn her Achilles (ironically — see above).